(Chronicle Books, 2010, $40) Photos courtesy of Chronicle Books. To make the pesto spread, combine the garlic, parsley, basil, arugula, pine nuts, olive oil, Parmesan, lemon juice, and salt in a food processor and pulse to form a paste. The spread can be made up to 2 days ahead and refrigerated. To make the meatballs, in a large skillet over medium-low heat, warm the olive oil. Add the onions and sauté until they are translucent and begin to color, about 15 minutes. Remove from the heat and let cool. Combine the beef, pork, eggs, milk, cheese, wine, bread crumbs, parsley, salt, pepper, red pepper flakes, and cooled onions in a large bowl. Using your hands, mix to combine. Form the meat mixture into small balls the size of apricots. Heat a large skillet over medium heat. Working in batches, add the meatballs, spacing them about 1/2 inch apart, and sear them without stirring for about 2 minutes. The meatballs will release from the pan when they are sufficiently browned. Continue to cook the meatballs until browned on all sides. Transfer to a plate and cook the remaining meatballs. To make the tomato sauce, drain the fat from the skillet and place over medium heat. Add the garlic and sauté for about 2 minutes. Add the tomatoes and deglaze the pan, stirring with a wooden spoon to scrape up the browned residue. Bring the tomatoes to a boil and reduce the heat to low. Return the meatballs to the pan and simmer for 20 minutes. Preheat the oven to 350° F. Spread the top half of the loaf with the pesto spread. Spoon the meatballs and sauce onto the bottom half and top with the provolone slices and then the top half of the loaf. Loosely wrap the sandwich in aluminum foil. Bake until the cheese has melted and the bread is crispy and toasted, about 25 minutes. Let stand for 10 minutes and then unwrap and cut into slices to serve. To make the croutons, preheat the oven to 400°F. In a bowl, toss the torn bread with the olive oil and a pinch of salt. If you are using the herbs, add them too. Spread the bread evenly on a baking sheet and bake until golden brown and crisp, about 15 minutes. Midway through the baking time, redistribute the croutons if they are coloring unevenly. To make bread crumbs, use your hands or a rolling pin to crush the croutons to the desired consistency. For a superfine texture, sift the crumbs through a sieve. If you like, add dried herbs fried in olive oil. Melt the butter in a skillet over medium heat. Add the leeks and sauté until soft, 6 to 8 minutes. Add the wine and cook, stirring occasionally, until most of wine evaporates, about 5 minutes. Remove from the heat. Heat a large, heavy-bottomed skillet over high heat. Add enough olive oil to coat the bottom of the pan. When the oil is smoking, arrange the mushrooms cut-side down in the pan and cook without stirring until seared and caramelized, about 1 minute more. Stir the mushrooms, add the radicchio, and cook until wilted, about 1 minute. Remove from the heat. To make the custard, in a bowl, whisk the eggs and salt until well blended. Add the cream, milk, pepper, nutmeg, thyme, cheese, and ham and whisk to combine. 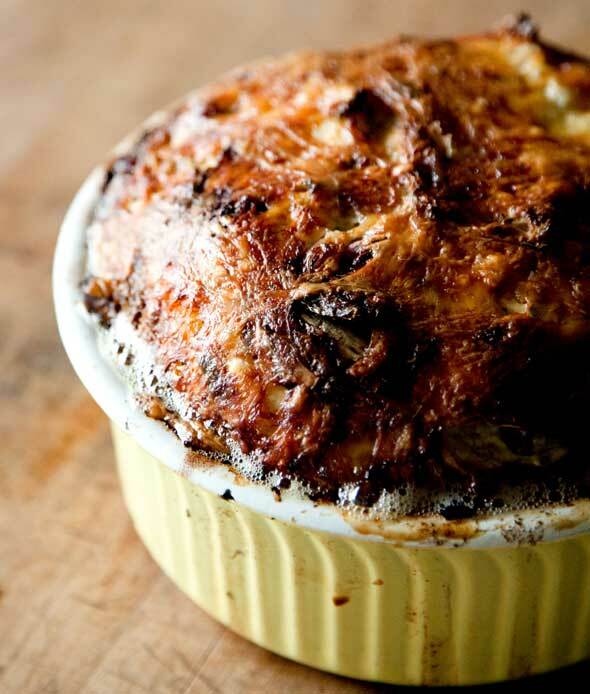 Place the bread chunks in an 8-inch soufflé dish and add the leeks, mushrooms, and radicchio. Pour in the custard so that it comes all the way to the rim. Sprinkle evenly with the cheese. Let stand for 8 to 10 until the custard saturates the bread. Bake until the custard is no longer runny in the center, about 50 minutes. Let the pudding rest for 15 minutes before serving.